I have to admit that spring is not my favorite time of the year. Spring is an unsettled time for me. I know that some of it has to do with the windy weather that we have. It also has to do with preparations for and anxiety over our upcoming summer season. This is a time when our expenses are high and income is low. So when the going gets tough, the tough go surfing. This spring has been much better. 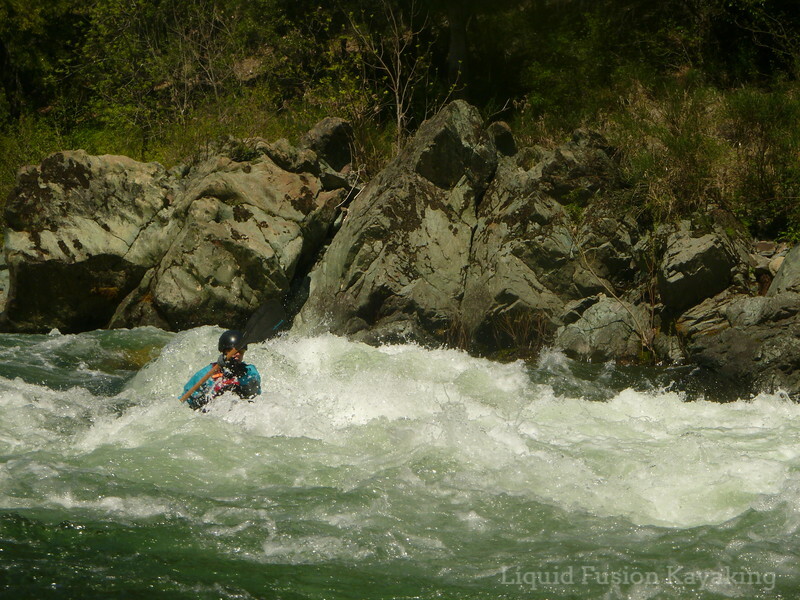 I have been out of town more that I prefer, but have had a lot of fun whitewater adventures including our Spring Rund-Oft Tour. Followed by a 5 day ACA instructor development and certification class on the South Fork of the American River with the Phil and Mary DeRiemer of DeRiemer Adventure Kayaking. This week, I was just back from the American River but was captivated by the beauty of spring on the Mendocino Coast. It is all about the birds and bees you know as our fellow creatures are doing their spring time things. When mountain biking through the forest, I feel like royalty riding on trails lined with wild irises and strewn with pink rhodedenron petals. In the creek areas, the carpet of "Forget Me Nots" is intoxiating. Clintonia, redwood sorrel, and columbines are also blooming. Of course, pedaling to a processional of blubbly Pacific Wrens, flute-like Hermit Thrushes, and attention-getting Olive Sided and Pacific Slope Flycatchers completes the magic. 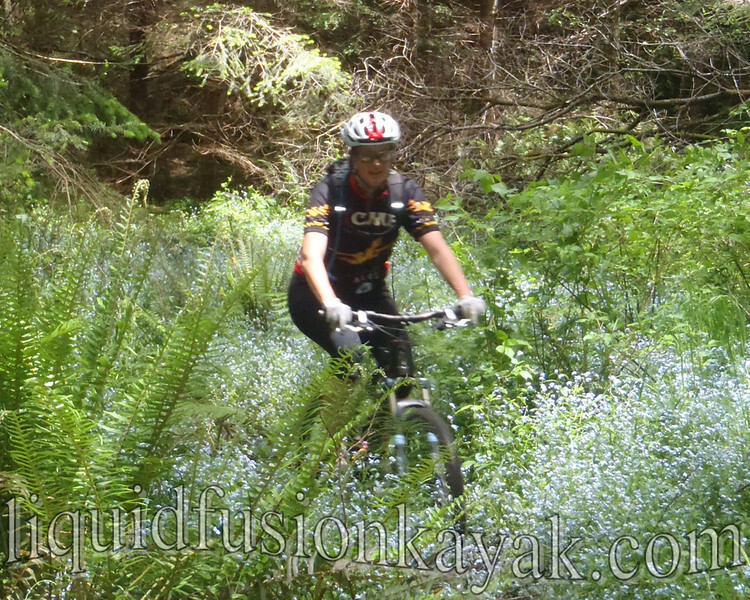 Amy of Mendocino Bike Sprite cruising on a trail lined with forget me nots. I am excited to get back into the ocean kayaking and rock gardening mode. Jeff and I decided to avoid the chaos of holiday weekends by creating a kayaking retreat for us and some of our lucky students. 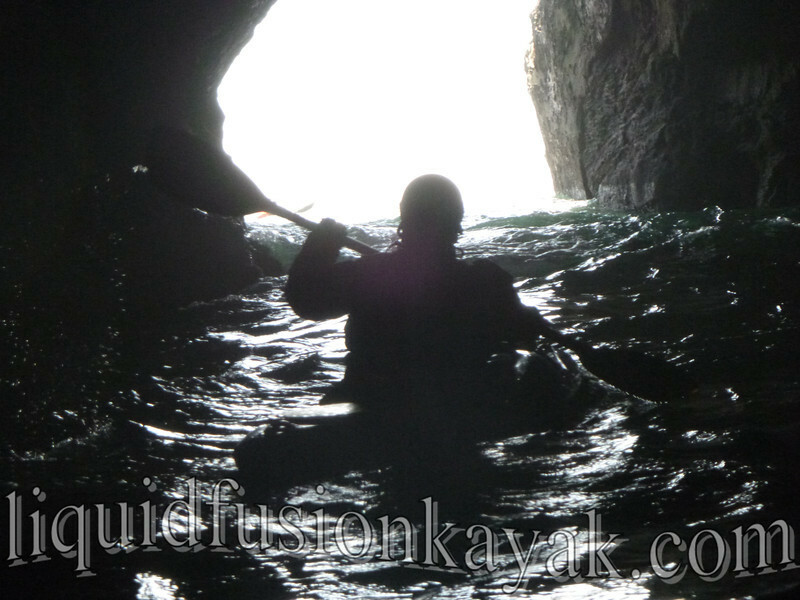 On both Memorial Day and Labor Day Weekends, we turn off the phone to host our Mendocino Wave n Caves Kayaking Weekends. This is a fun-filled weekend of camping and kayaking in the rock gardens and sea caves is fashioned after the Los Arborlitos and La Buffadora rock gardening trips that Jeff and Greg Knight used to put on for Aqua Adventures out of San Diego. 2 differences being though - we are rock gardening in Mendocino which many describe as Arbo on steroids and Jeff and I are cooking quality meals featuring some of our local specialties. This spring, I have to admit that I am even a bit excited about sea kayaking. I am loving paddling the Valley Gemini SP. 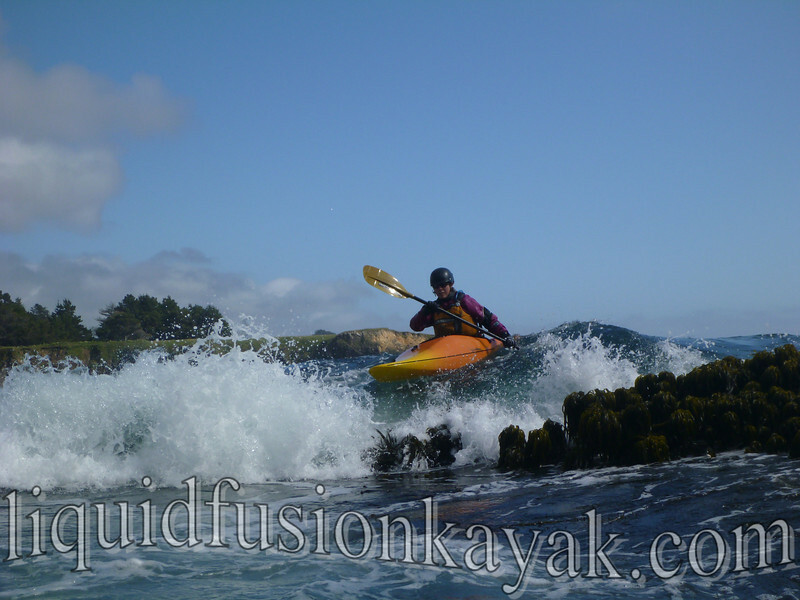 It is light, agile, playful, and comfortable and has rejuvenated my love of sea kayaking. I am looking forward to a surf zone session with her (aka The Black Pearl) to dial in my control and handling. 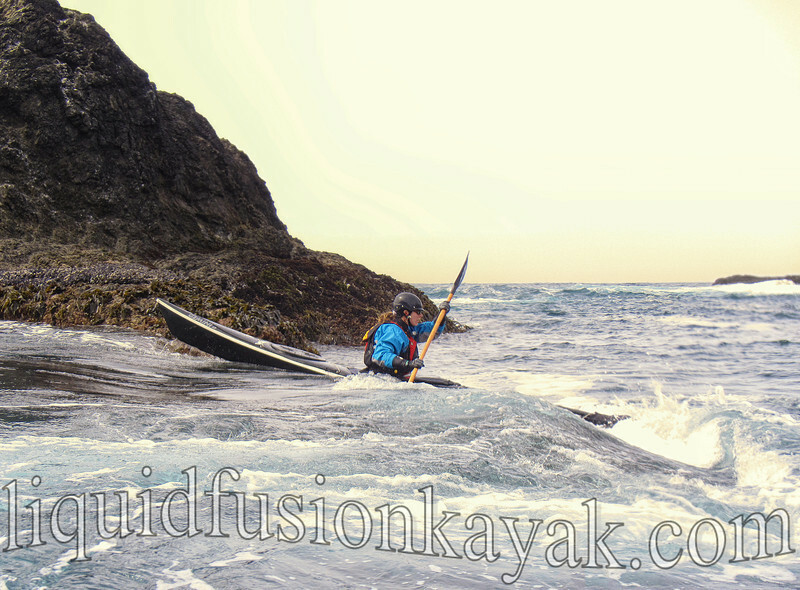 As of this spring, Liquid Fusion Kayaking has been in business on the Mendocino Coast for 5 years. 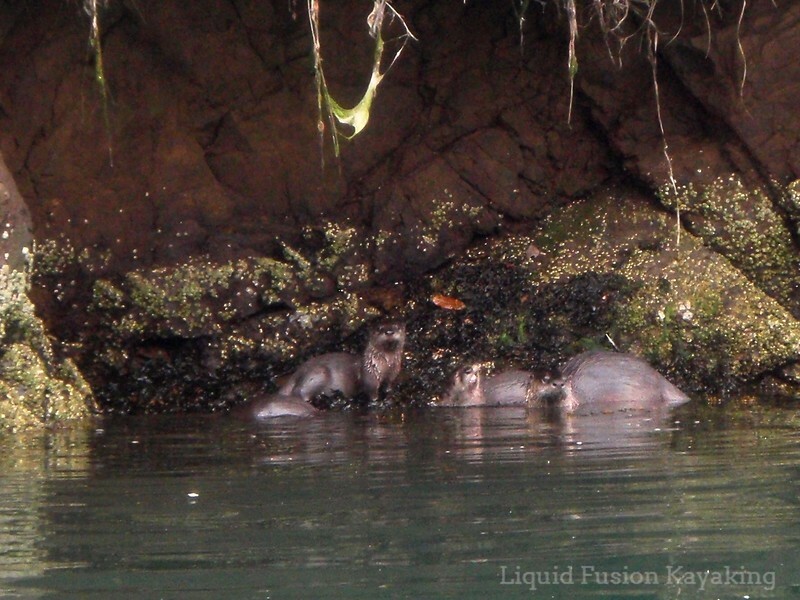 I am excited that news of Liquid Fusion Kayaking is buzzing around our local Fort Bragg and Mendocino Communities. When KZYX (local public radio station) announces our Afternoon on the Noyo River benefit for books for babies, our hearts fill with community pride. 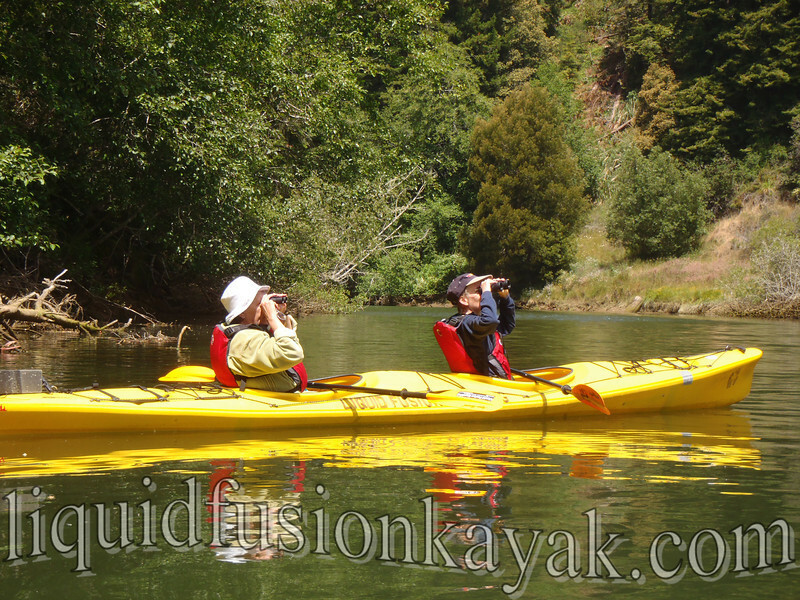 Next month, we are looking forward to hosting the Mendocino Coast Audubon Society on a kayaking and birding trip on the Noyo River. So really, life isn't good . . . It's GREAT!! !